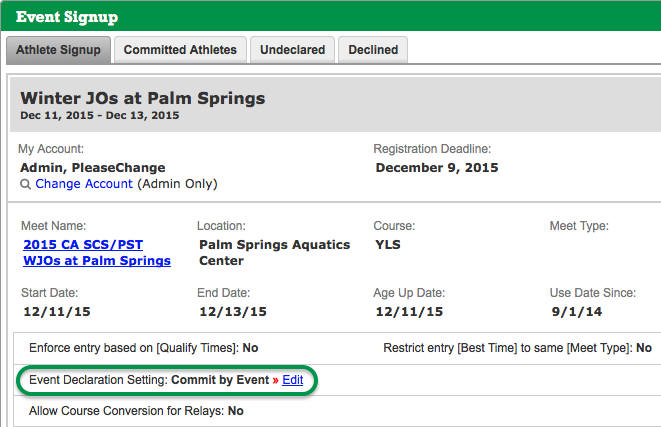 When you add an event and attach an ev3 events file, the default is to allow athletes to commit by event. For those teams that only want coaches to choose the events, you can set the event to only allow athletes to choose the days and sessions they will attend. Note: When the system is set to day/session, a parent will only be given days/sessions for which the athlete qualifies. In step 3, select the last option, Allow On-line Reg; Meet Manager/Meet Events file to allow On-Line meet entry. Select Import Meet Events file below. Navigate to the ev3/zip file and double click it, or click the file and click Open. Set Allow Athletes to commit by Event? drop down to NO, commit by Day/Session. Fill in the all other data and click Save Changes. If you do not set this when you create the event, you cannot edit the event to change it. Instead, you must use the below method. Use this method if you did not set the event to day/session when you created it. 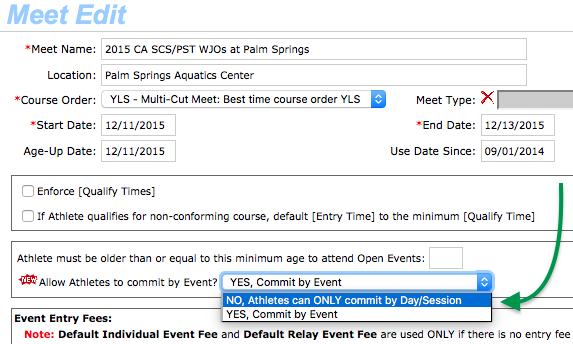 Find the desired event and click the Edit Commitment button below it. Click the Edit link to the right of Event Declaration Setting. Change the Allow Athletes to commit by Event? drop down to NO, Athletes can ONLY commit by Day/Session.